An all-inclusive resort in the Caribbean that is dedicated to families with a special Nickelodeon theme? 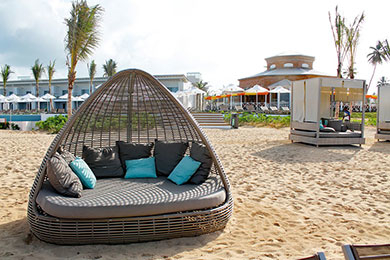 How could Karisma Resorts go wrong with this concept? Kids will love being greeted by SpongeBob, Patrick, Dora, Boots and the Teenage Mutant Ninja Turtles, and parents will love the tasteful dÃ©cor that just hints at Nickelodeon but still provides an air of sophistication. A Gourmet Inclusive Village continues Karisma’s brand of high-quality dining options; families can enjoy the beach, water sports and infinity pool, and the fun continues at the sports complex, kids’ clubs and water park. 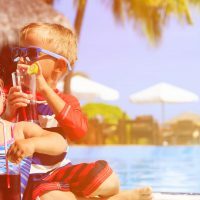 This is a destination resort that caters to families! 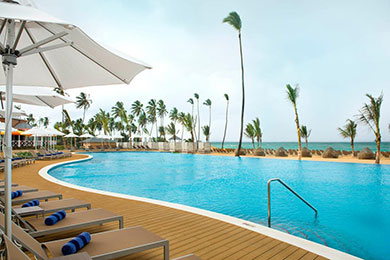 The resort is one half of a dual Karisma property: the other half is the Azul Punta Cana. 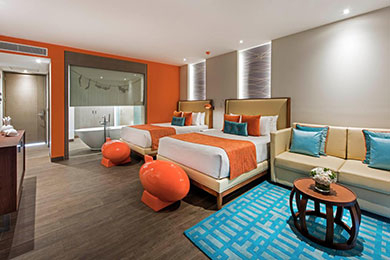 While the two properties share the restaurant and shopping village, beach and infinity pool, only guests of Nickelodeon can enjoy the water park, sports complex and special treats. The buildings on the left are Nickelodeon accommodations, as notable from the splash of orange in the balcony/deck furnishings, while Azul, to the right, is a more subdued blue and offers more adult-only accommodations and an adult-only pool. 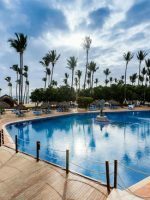 This makes the property also a good choice for multigenerational families, with grandparents enjoying the quieter Azul side of the property while families stay at Nickelodeon and come together in the middle for shared activities, dining and time together. 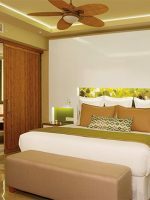 The smallest of the offerings are Nest Suites, which can sleep two adults. It features a king bed and a sleeper sofa, so single parents or grandparents often find these rooms best suited for them. For a family of four, Flat Suites feature a king bedroom with a sliding door to a living room with a sleeper sofa and private balcony. For families of up to six, Pad Suites provide two double beds and a sleeper sofa in a shared space. 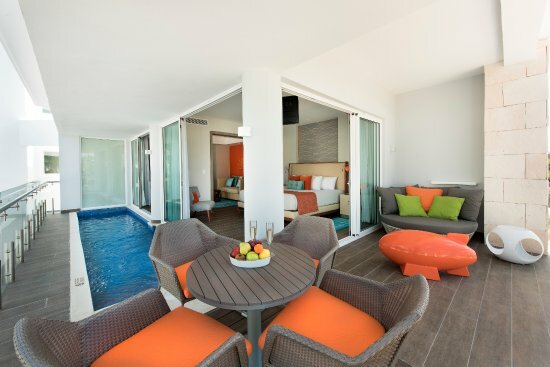 Ground-floor suites have direct access to a shared pool with all the ground floor suites, allowing families to hang out on their private patios and swim while younger children nap. These higher-floor suites have private plunge pools for families to enjoy without sharing or even being visible by other guests. Wraparound swim-up suites take corners and have larger terraces and pool space. Three villas with 1,300 square feet are two-story, private structures with their own pools. Named for each of the Teenage Mutant Ninja Turtles on the outside, on the inside, these sweet suites are tucked away behind high white walls with a garden, outdoor shower and butler service. One the main floor is a master bedroom with a king bed. On the second floor is a loft-style living room with two single beds. The room can accommodate two adults and four children or four adults and two children. Who lives in a pineapple under the sea? Kids will go gaga for this private villa that is a pineapple on the outside and looks like Bikini Bottom on the inside. (Don't worry, the parent's bedroom is nicely decorated.) The suite comes with all the amenities of Super Villas, but the suite is one of a kind. Stayed here for April vacation with our family. 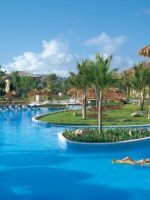 While the kids had a blast and the resort was very clean and staff was great, the one aspect of the trip that makes this resort just average for me and will not result in a return trip was the food. The food was average at best. The buffet and beach burger bar were consistently out of things like donuts, milk for cereal, cheese for the burgers, etc. I don't understand why it's so hard to keep a stock of these simple items, but for some reason it was and it was an inconvenience I wouldn't expect from a resort that you pay a lot for. Besides the average at best food everything else was great. The crÃ¨me of the resort is Aqua Nick's water park and splash pad. A lazy river, water slides and tipping bucket will keep the kids wet all day, and join the crowd every afternoon for the mass sliming that is characteristic of Nickelodeon. The children's supervised program at Nickelodeon is available for ages 4 to 12 daily. There is room for free play, structured activities, arts and crafts and more. A play place for kids and parents, you just may encounter your favorite character or two as they make frequent surprise visits. Kids can meet other kids and play soccer, basketball, tennis and more at the Sports Hub. The facility includes a clubhouse with two TV screens for Xbox and Wii games, a pool table and snacks. Children are welcome to join parents for spa treatments at the Vassa Spa. Spa menus include services for ages 5 to 9 and 10 to 17, including massages, exfoliations, facials, and body wraps. The salon offers mani's and pedi's, as well as haircuts. Located at the water park, Aqua Bite is a kid-filled, casual spot with swings for chairs and sandwiches, pizza and ice cream. It's open from 10 a.m. to 6 p.m. daily. One of the hardest reservation tickets to get at the resort is this high-end burger joint, where burgers are the size of your head. A great menu and funky dÃ©cor, this is a favorite for families. Open for dinner only. Reservations needed. For grab-and-go items, coffees, pastries and more, visit Doppio daily frim 7 a.m. to 7 p.m.
Poolside dining is available at Fresco, which offers outdoor patio dining, as well as pool chaise delivery. Lunch and snacks are offered from 11 a.m. to 4 p.m., and drink service begins at 10 a.m. The Slime Green Mojito Smoothie is a signature drink to try! For beachfront dining between 11 a.m. and 4 p.m., Lighthouse is a casual spot with indoor and outdoor seating. When you walk into the space-themed Spacewalker and its unique lighting and all-white dÃ©cor, you definitely will feel you have stepped out of this world. The concept is very cool, but again, the menu is a bit too fancy for kids to really enjoy it. Reservations needed. Offering breakfast from 6:30 to 11 a.m. and dinner from 5:30 to 10 p.m., Sugarcane is the resort's buffet restaurant. No reservations are required and the restaurant is created to look like a fresh market, offering an array of salads, fruits and vegetables, pasta, meats, desserts and kids' items. Indoor and outdoor seating is available. Open six days a week for dinner only, this whimsically designed Italian restaurant is a bit of a hit and miss. For kids' the menu is awfully limited, but for adults and the more adventurous, the menu features some unique and tasty items. Wine is only available by the bottle here, and is not included in rates. Reservations needed. 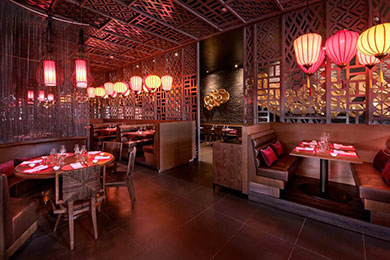 Also, open six nights per week for dinner, Wok Wok is the resorts Asian-inspired restaurant featuring wok-made dishes. Reservations are not required but suggested. Visit Zest at breakfast for Nickelodeon character breakfasts held on Saturday and Sunday mornings. From 8 to 10 a.m., with a reservation, families are welcomed in pajamas to the special event where kids will meet their favorite characters. The breakfast is in addition to the all-inclusive rates. This restaurant is only offered to Nickelodeon guests. Traveling with infants is easy with the resort's Gotcha Covered amenities that includes strollers, cribs, bottle warmers, baby food and kid-sized roves. Wi-Fi is included across the resort. Towels at the pool and beach require towel cards; be sure not to lose them! Beware of the rainy season, which falls in late spring, mostly in May. Deals may be good, but there's not much to enjoy at the resort if you cannot be outdoors during bad storms. June through September are the warmest months, where afternoon thundershowers often roll through and cool the resort off at night. The best time to visit for weather in December through April, with the lowest temperatures in the mid-60s, but these are also peak travel periods for families and the busiest. 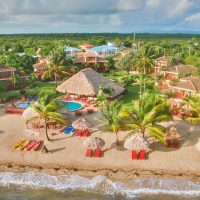 The resort is 25 minutes north of Punta Cana Airport in the Dominican Republic. A Nickelodeon-decorated bus will provide transport to and from the resort. As a destination resort, most guests do not leave unless it is to enjoy an excursion with a tour group. The resort's lobby provides tour group access and rental cars so families can get off the resort and enjoy the Dominican Republic in more depth. Kitchen 23 is the property's adult-only restaurant, for when mom and dad need a little time alone and refinement. The restaurant is not included in the all-inclusive program, but guests who splurge will enjoy molecular meals and signature drinks at the dinner-only spot. Reservations are required.